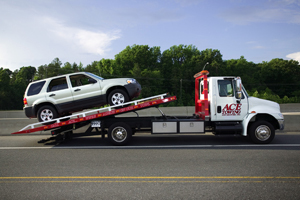 Ace Towing and Recovery, Inc.
"We're Always On Our Tows"
Welcome to Ace Towing and Recovery, Inc.
We are the best automotive towing service in the Charlotte, NC area. We proudly provide prompt, courteous and professional service to the state of North Carolina and surrounding areas. ACE TOWING & RECOVERY, INC. Legally Registered In the Whole State of North Carolina. Don't risk your transportation or equipment with any imitations. We offer professional, quality, damage-free towing. We strive to provide our community and visiting motorists the best possible service at the lowest possible cost. Our drivers and fleet demonstrate our commitment to our customers. We know the difference professional, courteous drivers and office staff make. In addition to our FAST and FRIENDLY service, we offer a full range of 4x4 towing, full recoveries, Class C RV towing, motorcycle towing and roadside assistance for those with flat tires, dead batteries, etc. Our customers rave of our superior service. We have maintained a constant customer base of individuals, auto clubs, car dealerships, and repair facilities. We tow seven days a week! Towing, Recovery, Wrecker, and Rollback Services of ALL types. MENTION OUR WEB PAGE & RECEIVE $10.00 OFF ANY TOW !!! We would like to hear from you. Please call, email or visit us and we will respond to your inquiry promptly. We are confident that once you get to know us, you’ll find that for all of your towing needs, we are the only call you will need to make. We want to take this time to thank you for visiting our page and invite you to write or call us for more information.